Hope you all had a great day and are settling in for a relaxing Thursday night. Justin & I headed out after work today to Lynfred Winery in Wheeling, IL to pick up a bunch of wine. No, we are not throwing a party. This visit was actually due to my procrastinating. You see, I joined Lynfred's "wine club," which is super cool, but, of course, not as cool as my OTHER wine club. In Lynfred's wine club, you give them your credit card/debit card information, and they charge you ahead of time for a bottle of the "wine of the month." I believe you can specify what "types" of wine you like, or go for the variety and be surprised. Technically, I'm supposed to go in each month to pick up my bottle of wine, but in case you haven't noticed, I've been just a little bit busy lately. Anyway, Justin & I picked up 4 bottles (I apparently haven't been in since June?!?) and enjoyed a tasting. 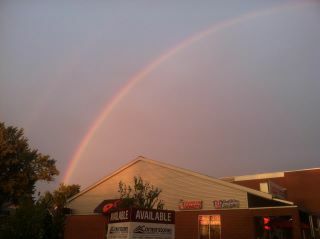 I have never seen a double rainbow, so I was pretty excited. We joked about how great the pot of gold at the end of THAT must be. The funny thing is, I distinctly remember believing that there really was a pot of gold at the end of a rainbow when I was a kid, and I'm pretty sure my friends and I looked for it once. Now, to get to the actual point of this post, I wanted to share the most amazing story with you all tonight, because it is just to darn cute to resist! Today, my friend & sorority sister, Becca, was proposed to by her very sweet (now) fiance, Matt. But, this was no average proposal, let me just tell you. Start here: The Love Story. And then go here: Proposal. I am so so SO happy for Becca & Matt. Becca is one of the sweetest people I know, and absolutely every nice thing that Matt said about her is 100% true. Justin & I also had the pleasure of meeting Matt and spending lots of time with him over our friends' (Ashley & Tyler) recent wedding weekend, and we felt like we instantly connected with him too. **Something to talk about: What's the sweetest/coolest/most "out of the box" proposal story you have seen/heard of? ?